Please don’t forget to check out my individual interviews with Pastor Don, Rabbi Ted, and Imam Jamal. That was awesome! Thank you, Three Interfaith Amigos and thank you, John! I felt uplifted, humbled, loved, and educated by all four interviews. I know it was good and “of god” because I am walking away feeling more love for the world I live in and all of the people in it. Thanks again. Funny how Interfaith religions are only represented by men. Not one single woman present to discuss matter on which men have always decided for them and ruled priviliging the male rights and interests over that over women. In the end, all women should steer clear from both from men and religions, considering how little consideration they have for women, their voice, their issues and have not only ignored women since the beginning of time but have harmed them in the name of all male viewpoint and representations. No wonder this world has been so bad for so long. The past four episodes have been my favorite Mormon Stories episodes of all time. I love how the Three Amigos present and embody the best that religion has to offer while truly addressing the abuses and destructiveness that are in all religious movements as well. Authentic, hopeful and affirming of all paths while celebrating the value in following the particular path or tradition that is right for you. The only thing more I could wish for would be Three Interfaith Amigas to hear insights from the feminine perspective. 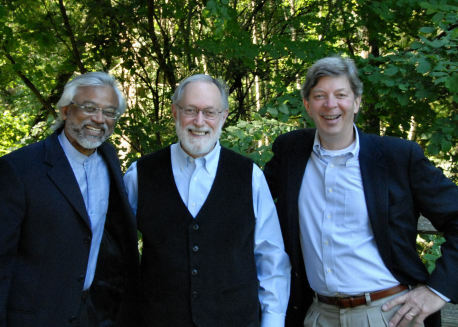 I totally “ditto” what Big L noted about the Three Interfaith Amigos and what they shared. I really learned a great deal about these other faith traditions and am so thankful to have had the opportunity to hear these podcasts. Thanks! Thanks! Thanks! (Thanks! x 3)! What a great series! I found the three amigos broadly critical and broadly accepting simultaneously. Certianly in my top 5 Mormon Stories Series. These were some of my all-time favorite podcasts. Thank you so much for the interviews, you were a great moderator and asked great questions John. I hope you bring them to Utah. And if you ever do, please see if you can record the sessions and offer them as podcasts to download and listen to. I am so willing to pay a fee for this! It would be wonderful to have them come and talk to Mormons in more depth with our specific concerns and questions. Interfaith is a great thing! Hopefully we will see more if this on Mormonstories! Good job! yeah! I really enjoyed the discussion. I love the idea of cooperating institutions and inter-religion understanding and acceptance. I get so much of the opposite from my priesthood lessons/discussions. The whole concept of missionary work drives me crazy, not so much if we find people who can use our message to better their lives, but when we pull “functioning” people from another religion to ours. As I listened, the thought kept coming to me… “Why can we not have discussions like this with our leaders?” They seem to be in hiding and only allowed to show themselves in scripted forums. What good is having a prophet if he is muted by a legal and marketing department? I would like to get to know them better as individuals, but The Church seems to not want that to happen. John, have you ever invited… say… Oaks, Bednar and Monson to do a podcast similar to this one? If yes, what were their excuses for turning it down? (I realize the Three Amigos are more analogous to bishops/stake presidents…? but…) Are they so unsure of their ability to express themselves in a “live” forum that they shy away? Do they want to avoid “controversial topics” so much that they are willing to sacrifice their “public face.” Why can leaders of other churches be so open and free to talk, but ours are absent? I think I know the reasons, and they reflect the immaturity of our religion, but I am wondering what others think. John and friends, I want to express my appreciation for your efforts to liberate the West from the veil of Mormon Oppression. You are the Bill Moyers of Mormonism. Having lived under pale of mormon thinking for many decades, my spirit is buoyed by your insight and honesty of inquiry. Interviews by open inquisitive clerics, “The Amigos,” is medicine for the Saints of Latter Days to ingest; self-scrutiny is the best elixir when it comes to extinguishing the persistence of doubt. Learning to let go of Joe; the next step would be to look into the bowels of this socialist theocracy and extirpate the superfluous, the extraneousness of the willfully ignorant and move to a humane inquiry into the human condition, The Amigos seem to have a handle on both, reality and theology. If Mormons would go back to their Amish Roots and build again, perhaps, a liberal flowering would occur, if not there are many other Tax-Free-Entities to join. As it is said, “All god’s Chillun got a place in the Choir, but at what cost to the family of man? Please keep the good works coming, I am pleased by your efforts — I’m sure many “Saints” are too. Thank you John Dehlin, but your best reward is off in the wild blue yonder. There is a special spot for folks like you. These are some of my favorite podcasts that I’ve ever listened to, and I’m quite the podcast junkie! Thank you, John, and the Three Amigos, for such interesting and fascinating discussion and information! This was a brilliant podcast and gave me hope that we can unite as one in spirit and in truth. Please accept my gratitude as you have filled in the gaps that cannot be filled by Mormonism which just makes me starving and searching to be filled. I agree that this podcast was amazing. The Three Amigos are unique from what I see in the world. A wonderful insight on where Mormonism could lead given the progressive movement that has come forth. Personally, I do not have the patience or desire to “wait” for people around me to engage in a different type of Mormon religious practice. I find my new worldview free from religious oppression as healthy and happy. Thanks John and the Three Amigos for the wonderful information and insights. Hits. Nail. On. Head. I feel so uplifted and inspired by these men, and at the same time so down and sad about my own religion (LDS). What’s the nest step for us? It depends where you are in your journey about the Church. I think if your other family members listened to this podcast they might understand that something has to happen in the LDS Church because members are leaving. I listened to a podcast on Mormon Expression called ten ways the Church is like North Korea and the pain and suffering that the church inflicts on people was expressed by one of the guests. My heart went out to him and others like him who have decided to leave and are rejected by their families. My husband and I are leaving, we are also looking at organisations who do all humanitarian work to give our tithing to. Great Stuff, many thanks to all of you! Love these three guys. We need more of these kind of people in the World. Thanks John for introducing them to us.